Jerry Fairchild Industries has been in business since the early 50s. It was a family business which started out as a machine shop wherein Jerry manufactured many different aircraft parts. One of the parts was a refueling valve. Jerry went on to making magnetic memory drums, which is basically what we know today as our first computer. The Navy used these parts for their flight simulators and the Steel Mills used them to run their plant. In the late 50s, Jerry got involved in sportscar racing. He built a one-of-a-kind fuel injected twin overhead cam Panhard engine. 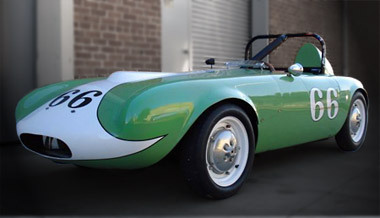 Throughout the history of the Fairchild, it is a standout, winning the H-Modified Class in the California Sports Car Club’s Pacific Cost Championship two years in succession (1958-1959). The car also placed second in the H-Modified in SCCA 1958. While working on the Panard project, Jerry contacted Bosch looking for more information on fuel injection. Jerry ended up purchasing a Bosch test stand in 1966 and opened up a fuel injection repair shop. Jerry started repairing early Mercedes diesel and gasoline injection system. Shortly after starting the Mercedes pump repair business, Jerry began repairing entire cars. 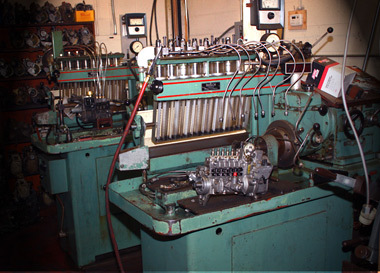 Jerry’s machine shop was extremely successful throughout the early 50s, 60s and 70s. Jerry gave up the sport car circuit and went into speedway motorcycles. Jerry built a 500 cc alcohol fuel injected speedway motor. Dub Farrel rode that speedway motorcycle and won hundreds of main events. I am Jerry’s grandson. My name is Robert Fairchild. I basically grew up in my grandfather’s shop in Pasadena, California, just fiddle farting around. Grandpa had me washing parts, jacking up cars, sticking my arms in tight places to unscrew parts, etc. In 1978 we moved the shop to Corona, California. I officially started working full time for my grandfather’s business in 1982, wherein I learned more about Bosch fuel injection and attended some of the classes at the Bosch training center. In 1989, my grandfather passed away, and I became the sole owner of Jerry Fairchild Industries. In 1991, I moved the business to Redding, California, wherein I have all of Jerry’s original Bosch equipment. I am now doing fuel injection repairs, an occasional tune-up and/or R & R of the injection system. There are just not that many German cars in Redding, California. UPS is my friend. I have been involved in our local Nascar Dodge Weekly Series. I was recognized as Craftsman 2005 Mechanic of the Year, Division II, for the Late Models at Shasta Speedway in Anderson, California, while working on the Logan’s Roadhouse Late Model driven by Gary Pyszora.